AMHERST, N.Y. - Earlier this month at the National Collegiate Athletic Association (NCAA) Convention held in Nashville, Tenn., Daemen College President Gary A. Olson was elected vice chair of the NCAA Division II Presidents Council, the body that helps set policy and the strategic direction for Division II colleges and universities nationwide. With his elevation to vice chair, Olson now holds a seat on the NCAA Board of Governors, the highest governance body in the NCAA, which oversees issues pertaining to all levels of NCAA-sponsored intercollegiate athletics. He joins Lt. Gen. Robert Caslen, superintendent of the U.S. Military Academy, and Dr. Samuel Stanley, president of Stony Brook University, as the only representatives from New York State colleges and universities on the Board of Governors. "We are pleased to welcome President Olson to the NCAA Board of Governors and as vice chair of the Division II Presidents Council," said Mark Emmert, president of the NCAA. "We believe he will bring valuable insight to the NCAA in these leadership capacities." Olson's election to this leadership role comes less than 18 months after being appointed to the council, which includes 16 presidents or chancellors from Division II institutions from across the country. 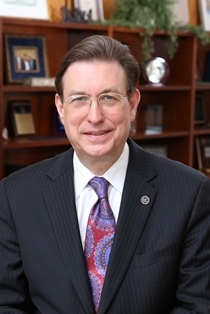 Following past practice, it is likely that he will ascend to chair of the Presidents Council, succeeding Glen Jones, president of Henderson State University (Ark.) at the completion of his term. Both Jones and Olson are eligible for reappointment in their current roles to another term this August. "I am honored to be selected to represent Division II institutions on a national level and to serve in this leadership role with such a prestigious organization," said Olson. "I look forward to working with my colleagues on the Presidents Council and on the Board of Governors to advance the NCAA's mission and to strengthen opportunities for student-athletes across the country." Olson will also serve as chair of the Division II Planning and Finance Committee, while sitting on the Division II Administrative Committee and the Board of Governors Finance and Audit Committee. "Dr. Olson's election to vice chair of the Division II Presidents Council comes as no surprise to those of us that work closely with him. He has a keen knowledge and understanding of the positive role that intercollegiate athletics can play on college campuses," said Bridget Niland, director of athletics at Daemen. "His commitment to the academic success and overall well-being of student-athletes will serve him well in this new and prestigious leadership role." Olson, who has a national reputation as a scholar, college administrator, and columnist, came to Daemen in 2013 from Idaho State University, where he served as provost and vice president for academic affairs. Shortly after arriving at Daemen, he provided leadership and oversight for the college's ongoing initiative to achieve NCAA Division II membership, a goal which was achieved in July 2015.